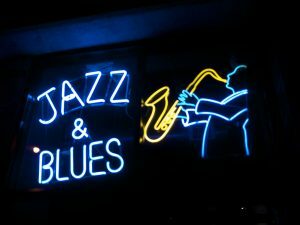 Blues and jazz are two distinct musical genres in their own right. They are probably intimately connected because they were both born in the American South. People easily get confused when it comes to understanding the two forms. This is due to the countless musical crossovers which are so popular with musicians at this time in the 21st century.. The home of jazz is in New Orleans. In the beginning it was referred to as “jass,” but later the double z substituted the last two letters, because jazz means cool. In the latter part of the 1800s, jazz found its way into a few of the popular brass bands of the time. Later down the road, its inimitable style was dominated by the trombone, cornet, piano, and sax. Blues arrived on the music scene much later than jazz, and was hugely popular in southern Mississippi. Then, the first recorded music came about in the 1920s. During that era, unlike the jazz ensembles, blues was normally a solo affair for the blues artist. And while it can be said that intricate blues music bands have been thriving for a long time, it must be noted that historically, the first solo player of the blues only had the use of his slide guitar. Since the time of its birth, the infiltration of jazz music has headed to the north of the US, to New York and Chicago. This exciting genre projected a good interracial feeling, and those in the North fell in love with its beat, thereby making the jazz sensation countrywide. On the other hand, the popularity of blues had made a limited filtration to Chicago and Texas. Because of this, prior to the 1950s rock and roll revolution, the support for the blues rendered it a more urban-type genre. Read more about the difference between Blues and Jazz.